Rajiv Gandhi Equity Savings Scheme, 2012 (RGESS) was introduced in Budget 2012-13 as a new tax saving investment by investing in eligible stocks and mutual funds through Demat account. ‘New Retail Investors’ who invest maximum of Rs 50,000 in ‘Eligible Securities’ and have gross total annual income less than or equal to Rs. 10 Lakhs 12 Lakhs (changed in Budget 2013) are eligible for tax deduction. For complete list of RGESS eligible stocks and Mutual Funds Click here. Public sector enterprises which are categorized as Maharatna, Navratna or Miniratna by the Central Government. Exchange Traded Funds and Mutual Fund schemes with RGESS eligible securities as underlying. IPO of public sector undertaking wherein the government shareholding is at least fifty-one per cent, which is scheduled for getting listed in the relevant previous year and whose annual turnover is not less than four thousand crore rupees during each of the preceding three years. 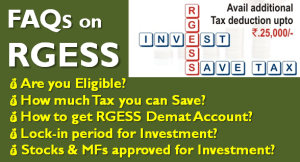 How much tax can be saved by investing in RGESS? Under RGESS, you are eligible for a tax deduction on 50% of the amount invested. Let us say, you invest Rs 50,000 under RGESS, the amount eligible for tax deduction from your income will be Rs 25,000. Alternatively, if you invest Rs 40,000 under RGESS, the amount eligible for tax deduction will be Rs.20,000. Also you can invest in eligible securities above the limit of Rs. 50,000, but benefit under the Scheme can be claimed only on investment upto Rs. 50,000. What is the holding period for investments made under RGESS? Once the investments are made in the eligible securities, they will be locked-in from the date of investment till one year from the date of last purchase of RGESS eligible securities. This period is called ‘Fixed Lock-in’ during which you cannot pledge or sell these securities. During subsequent two years called as Flexible Lock-in, you can sell and buy RGESS securities. However, you will have to maintain the value of RGESS investment for cumulative period of 270 days during each of these two years. What is ‘Flexible Lock-in’ period? This can be by way of increase in market value. This condition must be met for cumulative period of 270 days in a year for two years. How will the eligible securities be locked-in? Can I invest in eligible securities into the same account and not subject such investments for RGESS lock-in? The eligible securities brought into the demat account will be automatically locked-in. However, if you do not want certain securities credited to your demat account to be considered for the RGESS, then a declaration in the prescribed format (Form B) should be submitted within one month from the date of credit to the DP. Can I use an existing demat account for RGESS? In case you already have a demat account and are otherwise eligible for RGESS benefit, you can designate your existing demat account as a RGESS account by approaching your DP. Is there any specific document to be submitted to the DP for designating the demat account for RGESS? Yes. You should submit a declaration in ‘Form A’ duly signed by the account holder(s) for designating the demat account for RGESS. Can I hold other securities i.e., other than eligible securities in my demat account designated for RGESS? Yes. Other securities (viz., equity shares, debentures, bonds, mutual fund units, etc.) can be held in the demat account designated for RGESS. What will be the effect of different types of corporate actions like split, consolidation, bonus, rights, etc. on RGESS eligible investment during flexible lock in period? If there is any change in the RGESS investment due to corporate actions where investors do not have any choice (involuntary) e.g. split / demerger etc., there will not be any effect on compliance status of the account during flexible lock in. If there is any change in the RGESS investment due to corporate actions where investors have the option to exercise their choice and results in debit of securities during flexible lock in, the same will be considered as a sale transaction. What will happen to my demat account at the end of flexible lock-in period? Your demat account that was designated for RGESS will be converted into a regular or ordinary demat account at the end of the flexible lock-in period. If the security which was eligible under RGESS at the time of investment is no longer eligible, will my RGESS investment be affected? The security should be RGESS eligible at the time of investment. Such security will be considered for RGESS investment, even if it becomes ineligible at a later date. As someone Gentleman Mr. N.P. Kapoor asked above, my question is quite same that In 2013 March i opened a fresh Demat A/c with Edelweiss & invested > Rs.500000/- in 25 shares that time of SBI @ 2048/- per share, till date it is invested.I want to avail tax benefit this year 2015-16 FY under 80 CCG Rgess by investing 50000/-. Is it possible with old demat A/c transacted only once in 2013, be eligible or not this year on investment of 50000/-. Please share if any view on this matter…Omprakash Dansana, Brajrajnagar, Odisha 768216. RGESS is to encourage first time investors in equity. As you had already transacted in shares, you would not be eligible for RGESS tax benefit. i want to invest 50000 Rs in RGESS shall i get tax benefit on whole amount, i don’t have demat account. if u dont mind,one more question. can I open a tax saver FD in bank account which is not on my name. can I do like that..? Yes you can open FD in any bank irrespective of you having a savings bank account in the bank. list of stocks like L&T. Am I eligible for the RGESS..?I have also bought some of the ETFs mentioned like Golman. Also I hope this will help save tax other than 80C….plz tell me abt this as well. RGESS tax saving is in addition to the 80C exemption. As mentioned in the post you would be eligible for tax exemption under RGESS if you have not transacted from your demat account before Nov 23, 2012.
but if I wanted to turn this dmat accnt to rgess by any means and transact again for the mentioned securities…cant I do like that…..? You can do it at your own risk. Given that its a new thing, I am not sure how efficiently would IT Department would be able to track your transactions. I have a demat account, which i just used once to subscribe for the CARE IPO. Will i be eligible for RGESS?? Yes if you satisfy other conditions you would be eligible for RGESS exemption as CARE IPO was in Dec 2012. Is RGESS within the 1 Lac tax saving limit or in addition to that? I have previously invested in ELSS funds. Am I still eligible for RGESS tax saving? Yes you can still invest for RGESS. i have a Demat a/c with Reliance Money since 2010 and i have bought shares, MF & infrastructure bond through demat in 2011-12. Can I get benefit of RGESS? No as stated in the post RGESS benefit is for new investors. Can we take this benefit of RGESS by investing in Gold ETF, or GOLD fund? No not yet. As you can see only stocks part of BSE 100 or CNX 100 index are eligible and ETFs based on above are eligible for RGESS investment. You can check the complete list of ETFs, MFs and Stocks eligible for RGESS here. This seems to be a complex and impractical scheme. Lets hope we have some new equity investors by this RGESS! I agree its complex scheme!